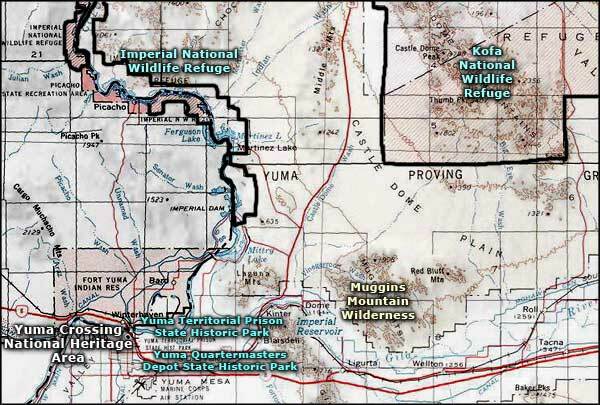 Yuma Crossing National Heritage Area is not a park per se but more an umbrella organization set up to assist in the conservation, restoration and management of natural, cultural and historic resources in the Yuma Crossing area. The particular target zone of the Yuma Crossing National Heritage Area is the lower Colorado River corridor and the historic Yuma downtown. Within the boundaries of the Yuma Crossing National Heritage Area are two Arizona State Parks: Yuma Territorial Prison State Historic Park and the Yuma Quartermaster Depot State Historic Park. As the first good ford of the Colorado River south of all the geological barriers, Yuma Crossing figures prominently in the history and development of the Southwest. When the first Spaniards reached Yuma in 1540, they found Native Americans who'd been living near the crossing for hundreds of years already. For whatever reason, the Spanish named their tribe the Yumas but today they are known as the Quechan and "Yuma" only applies to the town, the area and the county. The first Americans to arrive in the area were trappers searching out beaver pelts along the Gila and Colorado Rivers in 1826. After that, the next major group recorded to have passed through the area were the Mormon Battalion in 1847. With the end of the Mexican-American War in 1848 and the discovery of gold in California in 1849, the importance of Yuma Crossing grew exponentially. In those early days, the Colorado River saw a lot of steamboat action as steamboats ferried people and materials up and down the river, going almost to the Grand Canyon upstream. Then the railroad arrived in 1877 and steamboat traffic died shortly thereafter. But for many years, Yuma was the primary supply stop in southwestern Arizona and southeastern California. Yuma built up during those early years but had periodic problems with the Colorado River flooding and rushing through downtown. There was a particular flood in 1916 that almost wiped out downtown and forced the rebuilding of much of town. The federal Bureau of Reclamation was formed precisely to deal with problems like this and the first dams were planned and built along the lower Colorado to control the floodwaters. A lot of downtown Yuma that we see today was built in the 1916-1929 period and is presently going through an urban renewal program that is rebuilding, renovating and retrofitting much of the historic architecture with an eye to preserving that historic ambience. Yuma Crossing National Heritage Area is always open but the main office operates Monday through Friday from 8 am to 5 pm. The only fees involved are those of individual attractions and the state parks in the area. Photo of Yuma Quartermaster Depot warehouse courtesy of Wikipedia userid Edinyuma. Photo of main entrance of Yuma Territorial Prison courtesy of Ralph Hawkins, CCA ShareAlike 3.0 License.